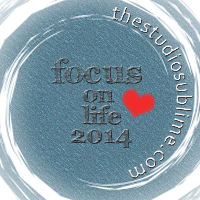 It's week 3 for the Focus on Life 2014 weekly photo challenge and we're sticking with the minimalist's way of thinking. As Sally put it, this week we're going to "use the minimum to get the most" and capture a "beautiful black and white photo of ourselves". Man, Sally knows just how to get all of us where it hurts! I do have to give her credit though. 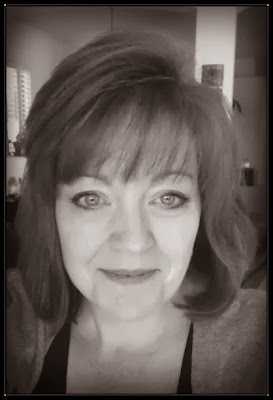 At least with the black and white minimalistic approach, you can't see as many of my wrinkles and all those icky blotches and scars on my skin from too many years of poisoning myself with the sun's rays aren't so harsh! I'm using my phone because I needed the practice taking more photos with it. I no longer have my iPhone - Logan has it now - but an htc rezound and I think it takes much better pics (usually) than my iPhone ever did. Although these, for whatever reason, are a bit more blurry than normal. Sorry about that. 'scolding" her for making us take 'selfies'! It was fun playing around with the Black and White edits, but I think I like my actual camera over my cell phone when I'm going to edit photos. I'm excited to see everyone else's photos because I know they are going to be super artistic, creative, fun and fantastic!! Peace, Love and Having Fun with Photos. Even Selfies! Thanks Cynthia! 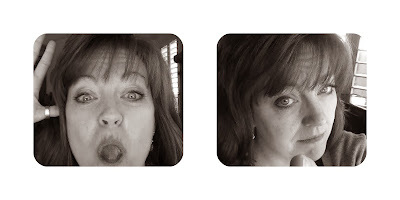 I'm not thrilled w/taking my own pic either, but those goofy ones were kinda fun! I like the second picture of you with such a nice smile. I have never been able to smile for the camera. Mary - I'm not able to comment on your blog again this week - it's my windows 8.1 and internet explorer 11 browser stuff going on again I think - but I wanted to tell I love your photo! I like how you can see a faint bit of a smile on the corner of your mouth!! Beautiful for sure!! Ok Miss Shel, you gonna get a scolding from me! "wrinkles and all those icky blotches and scars on my skin from too many years of poisoning myself with the sun's rays" means you have had a lot of fun and happy days, enjoying the sun instead of being stuck inside watching tv or on the computer or, worse, working, your life away! LOL Kashmira! I do have tons of laugh lines,...mostly from laughing at myself I should tell you, but yes, because I used to be outside as much as possible when I was in my 20's, especially when it meant hanging out at the pool or going to Mexico to the beach! You're a beautiful lady, Shel! I wish I had thought to make faces at Sally, haha! Hopefully we won't have to do this again. My feelings too! Why not have fun with this! Like your portraits, whether serious or silly. Thanks Beti. I had a bit of fun with them this week. You took a great photo and I love the fun ones too. Ha! Very cute. I think the third one is how most of us felt with this exercise. Good job with your phone photos. Thanks Paula. Yes, it wasn't working w/my other camera and I needed to work w/the phone a bit to figure some things out - it's still a learning curve w/all the apps, etc. Shel you are beautiful. The tongue sticking out is how I felt too. It made me laugh. Those silly faces, I'll give ya! You look beautiful!!! Now I have to go check out the phone you got, I'm thinking of making a switch from my iPhone. Beautiful photos Shel, even the silly ones!!! Thanks Sally. Oh, and I'm not sure they sell my phone anymore - Mike had to get me one like his for our business (so we're wonder twins!!) and he had get it on Amazon because they don't sell them in the stores anymore. Your photos are great! I love the the smile and the playfulness! Thanks Sandi - and yes you did - I loved your pics!! Awesome. You're just gorgeous! 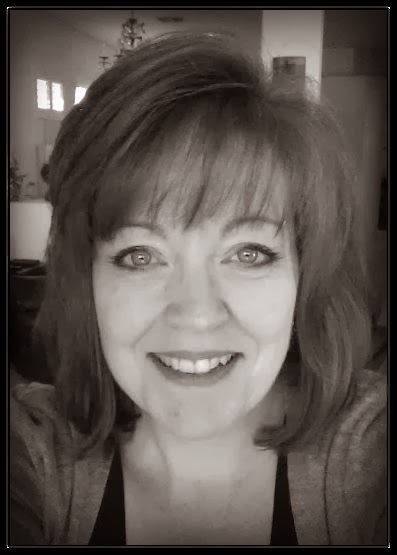 I think the B&W helped with my wrinkles and spots too! I love your goofing around photos too! Yep, Amy, I just had to do the goofing around ones - it's more fun to laugh than to judge myself!! Look at you! You even rock that scold face... I can tell you are a mum because you have a mum scold face lol. Beautiful! I do have a mum 'scold' face, don't I? Please tell my son,...he just laughs when I do this, Emma!! Of course, he's 16 and taller than I am, so it probably looks totally different (and funny) from his angle!! LOL!! Thanks so much for your kind words Erin - you're a doll!! You look lovely! never thought of using my cell phone in reverse mode... I did set my camera to B&W mode so that I didn't have to edit... now all I have to do is see if I can get if off B&W mode this week! Love the one with the tongue out! I love your photos, what gorgeous sparkly eyes you have! Beautiful! Your smile in the second one is dazzling! What a fun challenge for the group! Love seeing them all. Your sweet smile is the best!